DMXCalc helps you with all basic DMX address arithmetic for entertainment lighting system setup. What is the first dimmer number in this rack? What is the address for this fixture? What are the dip switch settings for this address? What is the percentage level for DMX level 187? Each DMX universe can contain up to 512 individual addresses or slots. When multiple universes are used in a lighting system, calculating the absolute address for channel patching can become challenging. For example, the 3rd address in universe 1 has absolute address 3, while the 3rd address in universe 2 is 515, and the 3rd address in universe 5 is 2051. 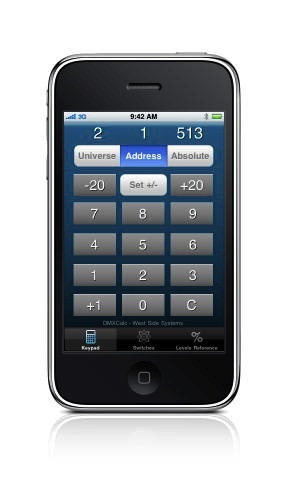 DMXCalc translates instantly between universe/address and the absolute address, in either direction. The Switches page shows the DIP switch settings for the current address, and you can change the address by changeing the switches. The Levels page contains a cross-reference list of all 256 possible DMX levels with the percentage and MIDI values for each. DMXCalc has been used on Palm® OS devices on and off Broadway for years.